I’m gonna confess right up front that’s not entirely true. It’s a huge debate, a line drawn in the sand. It’s like a team rivalry — are you a MU or a KU fan? (Sorry, I’m from Kansas City, it’s a HUGE deal here) I’ve noticed the same thing with writers. Which are you? A Pantser or a Plotter? And depending on where you fall, you’ve got an ally or a rival, because one type has trouble understanding how the other functions. I want to know why we have to choose? The truth for me is I am both. Don’t get me wrong, I could never snowflake and an outline seems way too much like eighth grade English class. *shudder* But I don’t sit down at my laptop with one line “It was a dark and stormy night” and expect to get an entire novel out of it. Sure, it takes one idea to get a novel started, and with me one idea can be a combustible tangent– the idea gets started in my head and explodes into a story in days. And I suppose I do plot, in my own way. I flow chart. This is the flow chart I made for CHOSEN on a white board. I even color coded it, ’cause duh, it looks cool. And honestly, it was a pretty good plot. Only what I hadn’t planned on, was once I REALLY let my characters take control, they didn’t always follow the flow chart. Somewhere along the top line, where it bends to the next line, Will started getting other ideas. And guess what? By the last line of the flow chart, I barely hit on the points listed. Hell, the ending even changed. The day I knew I was writing the end, Will started doing things that didn’t follow the plan. I literally shouted at my laptop. “What the f–k, Will?” (Fact: When I write Will, my language deteriorates.) But when I calmed down, I realized that I let him loose and it was what he would actually do in that situation. The result was much better than I planned. Now I’m writing HUNTED, the sequel to CHOSEN. I had a plan. Instead of writing flow chart, I made a nice four page bullet point list. I even color coded things like action, clues, foreshadowing. I ain’t gonna lie. I felt really smart. Guess what? It didn’t work. I sputtered and stalled. Bottom line is I start writing and the characters don’t always follow the plan. They don’t get crazy and completely change the story, but we don’t always get from Point A to Point B and end at Point C the way I planned it. 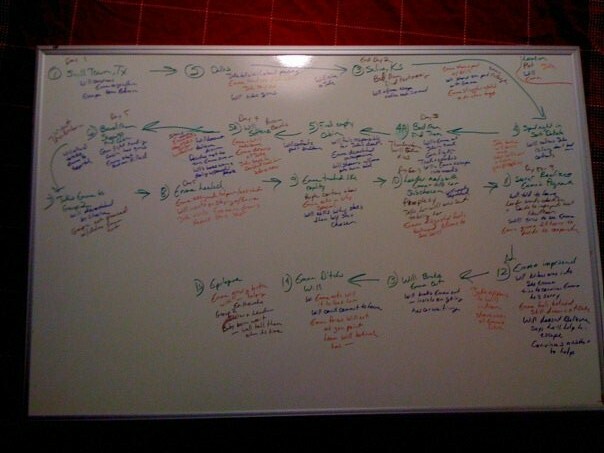 For me, writing a story is a lot like a multi weeks/months brain storming session. Ideas feed off one another and get my imagination rolling. Scene: Tina gets into skirmish with John. I write Tina defending herself (I never know exactly how this goes until I write it) I write that Tina kicks John in the crotch. My brain: Wow, Tina just kicked John in the crotch. What if she crushed the family jewels and John now holds her responsible and plans revenge. I hadn’t planned this twist. I didn’t even know Tina was going to kick John, let alone in the crotch. (I can’t wait to see the Google searches for this blog post.) And I may or may not use it, but it’s idea I wouldn’t have until I wrote the scene. As I mentioned, I stalled on HUNTED. I had 38,000 words written this summer and knew the last 8-10K were just wrong. The problem was I couldn’t figure out why. For a many reasons I won’t go into here, I let it sit and moved on to TWENTY-EIGHT AND A HALF WISHES. I pulled it back out this week, and after a recent revision of CHOSEN I figured out the problem. And with that realization the dam of ideas broke loose. I’ve spent the last few days revising what I had previously written on HUNTED, moving scenes around, changing dialogue, adding new scenes and I’m finally at a place where the old words are either used or will be trashed. I have my old color coded four pages of plot points to tell me where to go next but I realize a lot of the old ideas don’t work anymore. I know the end, but I have a wide open crevasse to get across from here to there. It is simultaneously terrifying and exhilarating. As I took my children to buy pumpkins, the scene that happens next came to me. And a few scenes after that. I see a hazy path to the end, the end I planned months ago. But I’ve grown enough to be flexible to not freak out. I’ve decided to embrace this foggy unknown and run with it. I’m excited to see what happens to the story during the next few weeks. I can’t wait to look back from the other side. Hopefully.